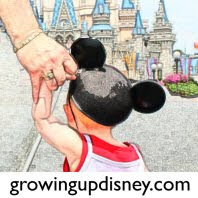 In those two posts I talked about using My Disney Experience to plan our May 2013 trip to Walt Disney World. I'd like to finish up by writing about using the My Disney Experience App on my iPhone 4 while at WDW. While at WDW, I actually did not use the app that much. I referred to it several times just to see how the the app was functioning in the different parks and resorts. I have been going to WDW since 1971 (I actually visited the Preview Center in 1970). So with over 40 years of visits, I don't need a map. I know exactly where I am. For someone who has not been to the parks for most of their lives, it would actually be handy. It will give you maps of the park you are IN without having to search for a park map. It uses the GPS in your phone to place you in a park or a resort and it gives you the pertinent information for your location. I set a reminder to watch the 3:00 parade in the Magic Kingdom and the app reminded me of the parade and suggested a viewing site. We had dining reservations that were stored on My Disney Experience also. It reminded us of the reservation and had the confirmation number stored. I don't remember how long it had been since I have needed the confirmation number for a reservation, but I always had it if needed. With the My Disney Experience app confirmation numbers are held in the app for you without having to put them in your phone. We did use it to check dining availability and to make one dining reservation. Everything worked very well. I'm sure it does much more than how I used it for while at WDW. It seamlessly integrated all our reservations and did all I expected it to do. Some functions only work while at the park so you'll have to load the app and take off to WDW to see how it works for you. If you have played with My Disney Experience website and app, what are your thoughts on how it works?